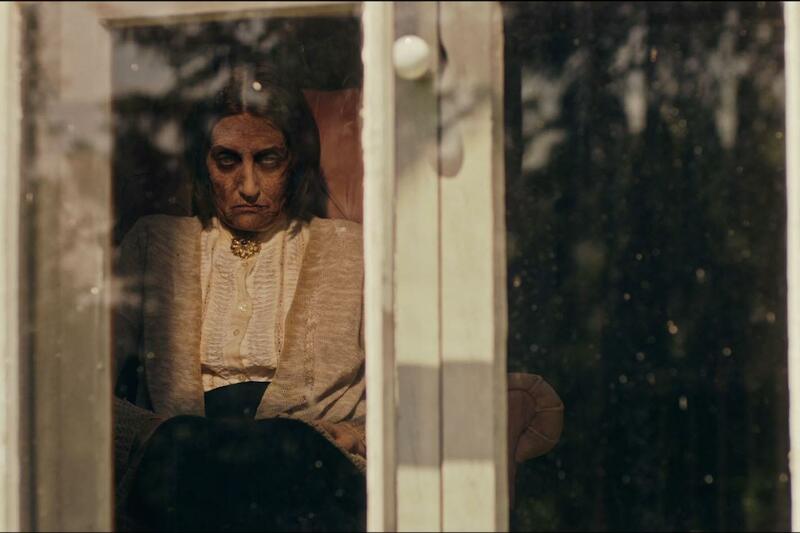 There is a refreshing originality to writer / director Andy Mitton’s subtle shocker The Witch in the Window, that manages to create a tense, edgy chiller from a premise which doesn’t initially hold great promise. Simon (Alex Draper – YellowBrickRoad) makes a living from buying run down houses and flipping them for a quick profit. However he may have bitten off more than he can chew with his latest project. As he takes his young son Finn (Charlie Tacker) to rural Vermont to work on a dilapidated farmhouse, the father and son soon realise there is more to the place than loose floorboards and peeling wallpaper. Something evil haunts its lonely corridors and dusty attics. Something which will stop at nothing to keep them from leaving, forever. The Witch in the Window‘s overall tone is understated, almost to the point of minimalism. The house and its setting are beautiful in the way only houses in rural America can be. Set on the edge of a lake, trees encroach on large expanses of lawn which surround the house on all sides. Inside the rooms are bare except for the most basic of furniture, ready for Simon and Finn to put their stamp on them. Empty sunlit corridors lead to rooms dappled with late afternoon shadows which play tricks at the periphery of your vision. And all the time both characters and viewer are aware of something or someone watching. Is this a figment of the imagination? Or is it because a previous owner called Lydia (Carol Stanzione) – the ‘witch’ of the title – has left her mark on the place. An indelible mark constantly felt throughout the film, even as a presence, long before Lydia inevitably manifests herself, which she eventually does with frightening ferocity. Though most of the film’s chills are old school, depending more on inference and suggestion than in your face visceral scares, it none-the-less manages to pull off some tantalisingly effective frights. At one point the viewer realises what is happening to Simon just moments before he himself does, leading to a uniquely disturbing scene, guaranteed to shock even the most hardened horror fan. Its total unexpectedness is alone worth the admission price. The film’s other aspect which is most surprising is that it revolves around a father / son relationship – between Simon and Finn – almost to the exclusion of all else. So often in films and other art forms – particularly if the creator wants to depict some form of fragility or susceptibility to paranormal forces – a female, whether in the form of a wife, mother or daughter, is involved in some way. Here however, apart from the occasional appearance of Simon’s estranged wife, and Finn’s mother, Beverly (Arija Bareikis), and of course Lydia herself, the narrative drive is taken up with the dynamic of Simon and Finn’s strained relationship, marvellously brought to life on screen by Draper and Tacker. A relationship thats fragility is pushed to breaking point, culminating in a totally unexpected and unnerving conclusion that, like The Witch in the Window as a whole, leaves an indelible, haunting image in the viewer’s mind.